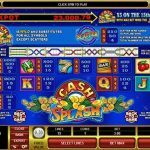 Cash Splash 5 Reel is a new and improved version of an already existing game with the same name from Microgaming, a very simple game with a progressive jackpot. The game is still accepted thanks to the familiar design of the large and traditional symbols. Vibrant colors and 2 dimensional symbols are someway ok, but what catches the eye is the constantly increasing amount on top of the reels. That is reason enough to try this game and hope for the best scenario. 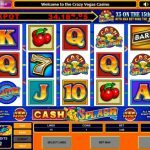 We have a scatter symbol in Cash Splash 5 Reel video slot game which offers a scatter pay out but that is not why we are here, if we are being honest. The Cash Splash symbol is the wild and it substitutes for all the other symbols to complete a winning line. We are here for the big prize, and to win that prize you need to land 5 Cash Splash symbols on the 15th pay line. This means, in order to win this prize you need to play on all pay lines available. Cash Splash 5 Reel is one of those games that can bring joy to your life. We have to thank Microgaming for that in the first place. Let’s be realistic, we play slots for fun in the first place, but we want to grab a bite of the big prize too. This is the right game for that. It is simple, yet straightforward. There is only one feature that you want to put your hands on, and once you do it is so worth it. No matter which version you like, the one with 3 reels or this one with 5 reels, we advise you to go for it. For playing the previous version of this game try CashSplash 3 Reel a 3 reel slot by MicroGaming.